Address Remarks: Previously listed as 27 E 1ST AVE. 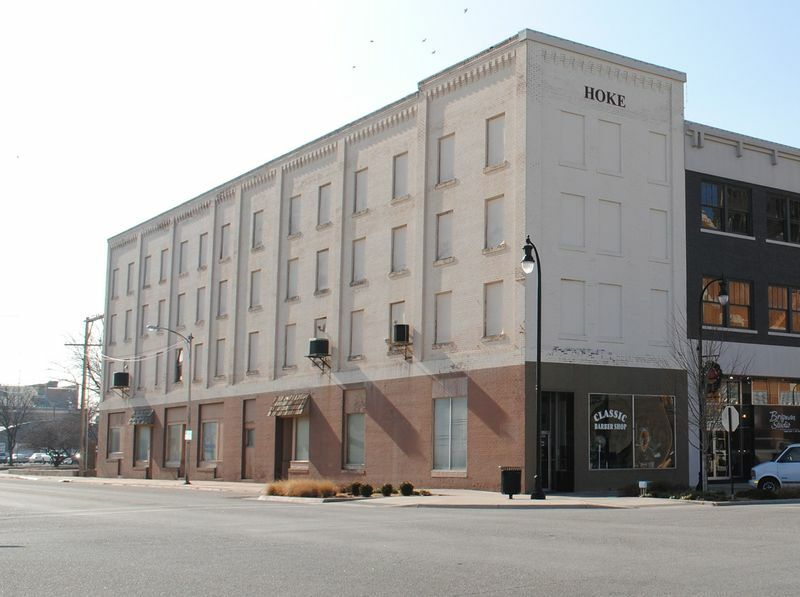 Historic Function Remarks: The Hoke Building was commissioned by Hutchinson real estate speculator and agri-businessman James S. Hoke and built in 1910. It is a four-story commercial block with retail shops on the lower level and office spaces on the upper levels. Its construction corresponded with the city's transition from farm town to agricultural and industrial powerhouse. As Kansas farmers turned to wheat as a cash crop, Hutchinson found itself in the center of Kansas wheat country. The Hoke Building provided office space for a growing list of wheat-related businesses and organizations. Among the original occupants was the Hutchinson Board of Trade, a grain exchange founded in 1910. In addition to Hoke's real estate office, the building housed eight grain company offices in 1912. The building also housed agricultural industries that were non-grain related, including a lab operated by bacteriologist Martin Dupray that developed animal inoculations and tested water and feed. Following the death of James Hoke, the building changed ownership several times until the Great American Life Insurance Company bought the building in 1952. Present Function Remarks: Barber shop on main level, most of building is vacant. This brick two-part commercial block is four stories in-height and occupies a corner lot. The primary (north) elevation is three bays wide and the east side elevation is fourteen bays wide. Upper-story fenestration defines the bays. A non-historic storefront occupies the street level façade and features a recessed entrance at the east end of the north elevation. The same design treatment extends the full width of the first story of the east side elevation, where additional aluminum-framed display windows and recessed entrances define the street-level bays. Each of the upper-story window openings contains painted plywood infill. Historic character-defining features include: the stone windowsills; the engaged piers rising the full height of the three upper stories on each elevation; the corbelled brick cornice that suggests a bracket motif; and the stone parapet coping. The upper-façade wall treatment extends the full length of the east elevation. Condition Remarks: Metal 1950s facade has been removed; windows boarded. Painted brick. Register Status Remarks: The building was nominated for its local commercial significance. Hoke Building. Slipcover spanned 23-25 E 1st Ave. 02/1990. Hoke Building. 25 E 1st Ave. 03/2011. Davis, Christy. Hoke Building. 25 E 1st Ave. Typical upper floor. 03/2011. Davis, Christy. Hoke Building. 25 E 1st Ave. Base map courtesy Reno Co GIS. 03/30/2011. Hoke Building. 25 E 1st Ave. First Floor Space. 03/2011. Davis, Christy. Hoke Building. 25 E 1st Ave. National Register Nomination. 02/14/2011. Davis, Christy.